The Kamov Ka-25 (NATO reporting name 'Hormone') was a naval helicopter, developed for the Soviet Navy in the USSR from 1958. 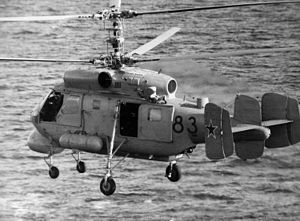 In the late 1950s there was an urgent demand for anti-submarine helicopters for deployment on new ships equipped with helicopter platforms entering service with the Soviet Navy. Kamov's compact design was chosen for production in 1958. To speed the development of the new anti-submarine helicopter Kamov designed and built a prototype to prove the cabin and dynamic components layout; designated Ka-20, this demonstrator was not equipped with mission equipment, corrosion protection or shipboard operational equipment. The Ka-20 was displayed at the 1961 Tushino Aviation Day display. Definitive prototypes of the Ka-25 incorporated mission equipment, corrosion protection for the structure. The rotor system introduced aluminium alloy blades pressurised with nitrogen for crack detection, lubricated hinges, hydraulic powered controls, alcohol de-icing and automatic blade folding. Power was supplied by two free-turbine engines sat atop the cabin, with electrically de-iced inlets, plain lateral exhausts with no Infra-Red countermeasures, driving the main gearbox directly and a cooling fan for the gearbox and hydraulic oil coolers aft of the main gearbox. Construction was of stressed skin duralumin throughout with flush-riveting, as well as some bonding and honeycomb sandwich panels. The 1.5m x� 1,25m x� 3.94m cabin had a sliding door to port flight deck forward of the cabin and fuel tanks underfloor filled using a pressure refueling nozzle on the port side. A short boom at the rear of the cabin had a central fin and twin toed in fins at the ends of the tailplane mainly for use during auto-ration. The undercarriage consisted of two noncastoring mainwheels with sprag brakes attached to the fuselage by parallel 'V' struts with a single angled shock absorber to dissipate landing loads, and two castoring nosewheels on straight shock absorbing legs attached directly to the fuselage either side of the cockpit which folded rearwards to reduce interference with the RADAR, all wheels were fitted with emergency rapid inflation flotation collars. Flying controls all act on the co-axial rotors with pitch, roll and collective similar to a conventional single rotor helicopter. Yaw was through differential collective which has a secondary effect of torque, an automatic mixer box ensured that total lift on the rotors remained constant during yaw maneuvers, to improve handling during deck landings. Optional extras included fold up seats for 12 passengers, rescue hoist, external auxiliary fuel tanks or containers for cameras, flares, smoke floats or beacons. Ka-25BSh (NATO reporting name 'Hormone-A') Variants are used in the anti-submarine warfare role, equipped with radar, dipping sonar and a towed MAD and armed with torpedoes and nuclear or conventional depth-charges. Ka-25BShZ Mine-sweeping version, eight built. Proposed assault version in competition with the Mi-22 and the larger Mi-24. Full glazed nose, cargo compartment with four doors, an under-fuselage turret (GSh-23L), provision for six 9M17 or six UB-16 or bombs. (NATO reporting name 'Hormone-B') Over The Horizon targeting version for relaying data to cruise missiles launched from surface warships and submarines. Anti-submarine equipment, Electronic Surveillance Measures and weapons bay removed and larger radar scanner/reflector in a bulged radome under the nose. Also recognisable by a small cylindrical data-link antenna under the rear fuselage. (NATO reporting name 'Hormone-C') Search and rescue and transport version with no weapons bay, radome as Ka-25BSh. Normal equipment included seats for 12, rescue winch, provision for stretchers and auxiliary tanks. Optional equipment included a homing receiver, Electronic Surveillance Measures, searchlight and loudspeaker. Ka-25PS helicopters were usually painted red and white. (NATO reporting name 'Hormone-B'): Possibly mis identified or wrong designation for Ka-25K OTH targeting relay aircraft. Missile tracking version. Also known as the Ka-25TI and Ka-25IV. Taylor, Michael J. H. (1996). Brassey's World Aircraft & Systems Directory. London, England: Brassey's. ISBN 1 85733 1981 1.